Was the FBI getting too close to the truth about Trump's transition team and Russia? Something suddenly changed. Out of nowhere Dump fired James Comey saying he mishandled Hillary Clinton's use of a private email server while she was secretary of state. How did that suddenly become an issue in the midst of the investigation on Trump and Russia? Why didn't Chump fire Comey on Day One if that was the case? It doesn't take a genius to see what's happening. Bump is eliminating anyone he sees as a threat to expose his corruption. Don the Con said he acted on Deputy Attorney General Rod Rosenstein, and his favorite puppet Attorney Jeff Sessions, recommendation. 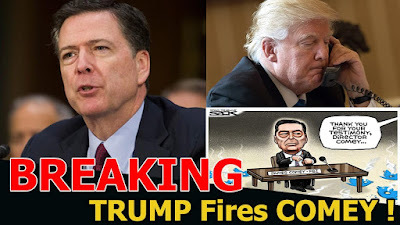 The fact of the matter is both men became enforcers and made up a reason to fire Comey because Chump wanted him gone. Never mind that Sessions lied under oath or that he would do anything for his orange-faced master. Never mind that Sessions may someday be called on to testify in the Russian investigation and that he had to recuse himself from it. The fix is on. You better believe the person replacing Comey will be a shoe-licker and yes-man for Stump. This desperate attempt to hinder the investigation just goes to show the lengths Lump will go to hide his corruption. Comey wasn't given any notice. Just Hump's signature "you're fired!" in a personally signed letter. Donny Little Hands has viciously assaulted our intelligence community, the judiciary, the environmental protection agency, immigrants, and any American that dares stand up to him. It's just a matter of time before he declares martial law. We are in a Constitutional crisis. Who Else Has Trump Fired Since Taking Office?